The armrests on this drafting chair provide enhanced comfort, for the duration of your project, and beyond. 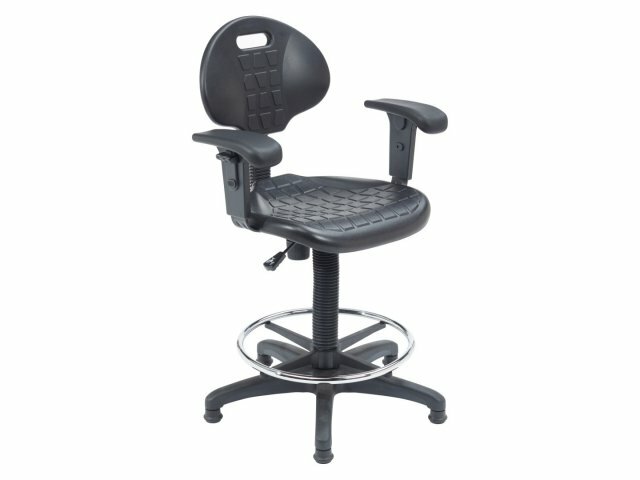 The NPS Kangaroo Drafting Chair provides unique strength and function for your industrial seating demands. With multiple adjustments and a supportive design, professionals can enjoy customized comfort throughout the workday. 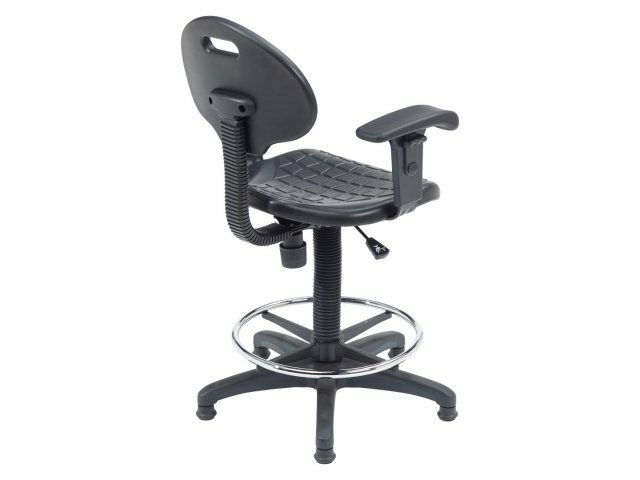 Pneumatic seat-height adjustment, an adjustable footrest and adjustable back angle accommodate many different body types as well as work surfaces of various heights. Designed with beauty and grace in mind, this drafting chair is ready to stand up to tough and constant use. The heavy-duty, chemical-resistant polyurethane seat has a ribbed design which allows for healthy circulation. Built-in lumbar support and a full swivel make this drafting stool an excellent choice for art and architecture applications. Personal Fit: Adjustable-height armrests give you a perfect fit. Mobile: Backrest has a handle for easy moving and steering. Seat Height: Adjustable from 22" - 32". 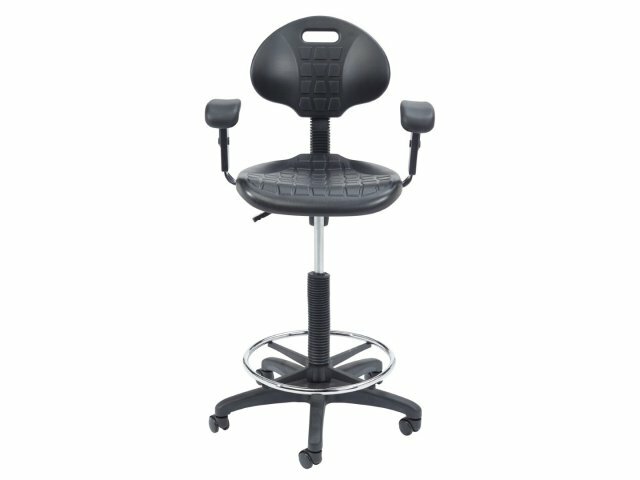 Durable Seat: Heavy-duty polyurethane seat is chemical and puncture resistant, and cleans easily. Comfortable Design: Waterfall seat edge reduces pressure at the back of the knees and promotes healthy circulation. Healthy Ventilation: Ribbed seat and back design facilitates air circulation. Natural Support: Lumbar support promotes natural sitting posture. 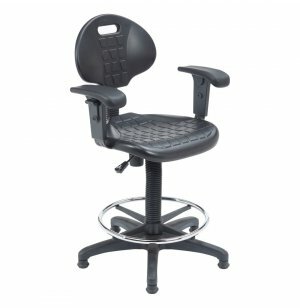 Adjustable Back: Integrated under-seat spring system adjusts backrest tilt angle with the turn of a knob. Convenient Options: Built on 2" industrial-grade casters for portability. Mushroom glides included for use in a stable environment. 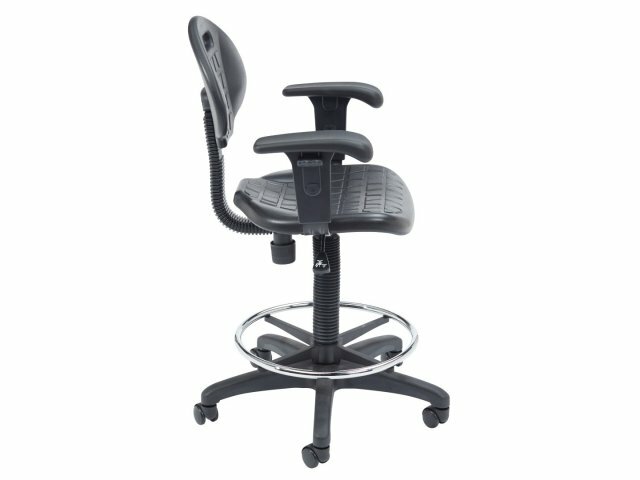 Custom Configuration: Pneumatic seat-height adjustment and an adjustable-height footrest facilitate personalized positioning. Super Strong: A 300-pound weight limit accommodates professionals of many sizes.